Finally, it has happened. The most eagerly awaited, the most dreaded and the most unexpected, have all happened in a flash. It was just when nothing remained but a glimmer of hope, when all was forgotten but a few annual rituals and public holidays, when the constitutional system, the reckless youth and the rotting middle class were all written off, when the status quo came to be taken as the perpetual reality, and when democracy verged on the anarchy, the history of non-violence and the culture of Satyagraha that were relegated to museums and history books, were brought back to life by a movement in all its prowess, in a show of strength of dimensions beyond imagination. It was a long forgotten folklore that the Parliament existed for its people. It was as if the systems invented to serve the humans, developed their own 'Artificial Intelligence' and started enslaving their masters. And the masters were beaten to believe that they were the slaves, and that the machines were designed to rule over them. It was the stuff that Matrix and the Terminator are made of. The political class assumed supremacy, and the citizens became their subservient servants. While the ruling class enjoyed their lives, the people were kept in the dark, blind-folded. And the bureaucrats were able to get away with it all. The machines made the rules in their own favour - and broke them at their own will. And it became the way of life, and the way things worked in here. And, as is typical, the youth were reckless, the elite were careless, and the middle class, hopeless. When corruption began to rule, the people were left searching for a leader. As corruption spread far, deep and wide from within, the system was left with a hollow core - and the vacuum was felt all around. People knew Mahatma Gandhi was History - and accepted that the modern age was all about frustration and desperation. APJ Abdul Kalam was a ray of hope in a dark cloud with no silver lining. But he was in a system that showed no mercy to the exceptional. When Mumbai came under attack, it was as if the nerves had transmitted a weak signal in a monster in deep slumber. Some sparks here and there, and a few days later, it was business as usual. When Anna Hazare was in the news initially, the news channels found it an opportunity to flash something short of a sensation. And no pundit, back then, would have predicted him, an ageing, worthless man with nothing to lose, to become a brand to reckon with, and to weave a dream in every Indian's eyes. But what has transpired when a simple man put himself on the line and threatened to give his life - virtually his only possession - away, for a cause that he believed in, was unbelievable. The Parliament was forced to do its duty. The law makers were forced to draft the rules. The politicians were forced to go to work. Every bureaucrat was forced to turn back, sit up and take notice - with alarming concern, noting that this time, people were putting him under the scanner. For the first time in a long while, corruption started seeming to be a dirty word! There are many signals that the unprecedented event in Free India has sent across to all quarters of the social and political scheme. And every actor in the play would be taking home their own lessons from the famed Ramlila Maidan, or Ramlila grounds, which the poor patriot, Anna Hazare, had made his home of late. And he did have more than his share of visitors to his new home. Hectic parleys, discussions and debates, heated altercations, arguments, accusations, they all had to give way when a protest turned into a movement like never before. Some may call it revolutionary, some may baulk at it as setting a dangerous precedent in arm-twisting the big brother into action, and some may hate Anna Hazare with all of their lives' assets and properties. This is the success of an impeccable person with his heart full of willpower and literally nothing to lose in life, and of branding a campaign and coordinating it to precision, aimed at making the system take notice and respond. However, there is virtually anything that Team Anna could make of what is nothing but its initial break through. The nation may be filled with Euphoria, celebrating what they may see as their victory over the oppressors. But what the team makes out of the very beginnings of a movement, is entirely up to the team that made this happen. With Anna mentioning of Electoral Reforms even as the Finance Minister, Pranab Mukherjee, had just initiated the debate on Lokpal Bill, the bureaucrats may have a hard time going to sleep peacefully, for the first time in a long while. The reality, however, is that the problem has just got its share of attention. And the problem runs much deeper than what it may ever seem from the outside. The celebrations mark the beginning of a new phase in the Indian political history, but change is still at a distant horizon. It would be naive to think that what flew out of the Pandora's box would creep back grudgingly into it with the stroke of a legislation or with the coming of age of an apolitical system called the civil society. The common man, about whom this has all been about, is still out there in the fields and along the vast country side, reading about and discussing Anna Hazare, and counting his hard earned daily wages, as he gets ready to cast his vote to the political party that would pay him the most or would gift him the goodies. 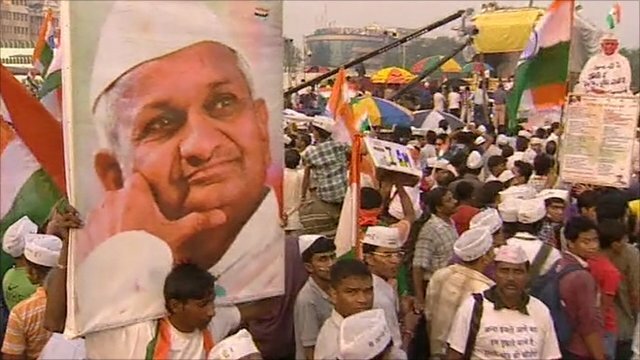 To him or her, New Delhi is a different world, and Anna Hazare could well end up to be someone who adamantly refused to eat for two weeks while sitting in the open grounds. Without the last citizen in the queue educated, informed and empowered to deal with their life on their own terms, the political machinery, with its artificial intelligence that it has now got used to, would take every opportunity to strike back - with vengeance.